Travel north on Rt 83. In Minot, Rt 83 is called Broadway. From 83 go east on Burdick Expressway (note that Trinity Hospital is located on the corner of 83 and Burdick). On Burdick, pass over the bridge, then turn left at the 1st light after the bridge onto 9th St. Immediately turn left again at Riverside Dr, then follow Riverside Dr, which turns into 6th St. The church is to the right. The Liturgical language is English. Weddings, Panakhidas, Moliebens, Baptisms, etc. can be served in Church Slavonic or Greek as requested by the family. 6:00 PM Vespers and Confessions. 10:00 AM Divine Liturgy followed by Fellowship Hour. ON THE 1ST, 5TH, and LAZARUS SATURDAYS DURING GREAT LENT, Divine Liturgy is served at 10:00 AM. 10:00 AM Divine Liturgy. On certain lesser Feasts, Matins only is served at 10:00 AM. 6:00 PM Liturgy of the Presanctified Gifts. For more information on services, call the priest at 701-838-3094. Also, call to arrange special services (Baptisms, Weddings, Moliebens, Funerals, etc). 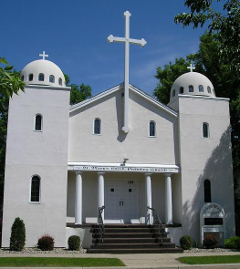 St Peter the Aleut parish was founded in 1982 by Orthodox of various ethnic backgrounds. The parish contains Greeks, Russians, Ukrainians, converts, and in our Bismarck Mission, where we serve twice a month, Serbian families. In September, the parish organizes a Greek festival. Also, during the winter months, the parishioners gather at the rectory for Religious Education twice a month to learn more about the faith and grow in the fellowship of Christ. At our church visitors are welcome and greeted by all members of the parish. For further information on our church, please contact the priest at 701-838-3094.